Yellow is a soothing colour that reflects light rays in the most distinct fashion. 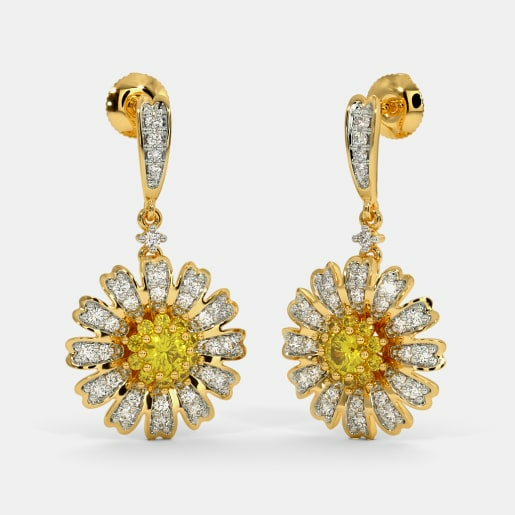 Yellow tones in jewellery denote elegance, warmth, and grace. They not only make for good office wear or daily use pieces, but the complexity of designs easily sets the tone for parties, cocktail evenings and other special occasions. Beautiful yellow sapphire earring designs can be found at online stores and established jewellery shops today. Considered to represent the planet Jupiter, many women buy this expensive gemstone to seek the blessings from the planet. Although blue sapphires are common, yellow could be relatively rare, however, their designs are not limited. 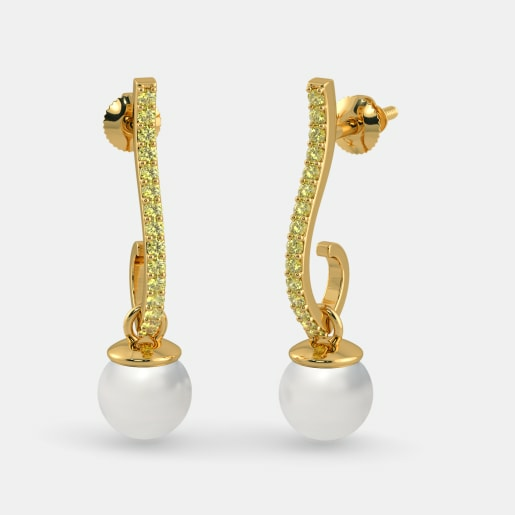 Take a look at the markets today and you will figure out the vast variety of different textures and patterns that will enable you to buy yellow sapphire earring designs of your choice. Moreover, yellow sapphire is a safe bet in terms of colour. It displays a subtle yellow hue, thus making it ideal to gift it those whose choice of colours is not known. It is often seen and confirmed that designs close to nature are the best designs. Basking in beautiful patterns of flowers, leaves, birds and twines are various patterns seen in the jewellery stores today. 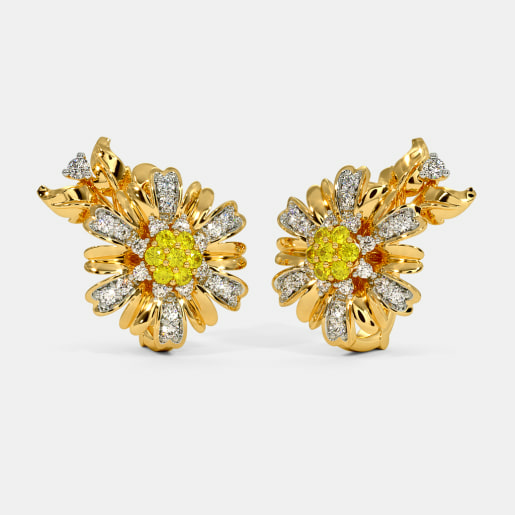 All you have to do is take time out to glance through the abundant range from the convenience of your homes and buy yellow sapphire earrings online. If you are looking for exquisite designs and patterns inspired by nature, then you are in the right space. BlueStone has some of the most elegant studs true to their natural habitat. 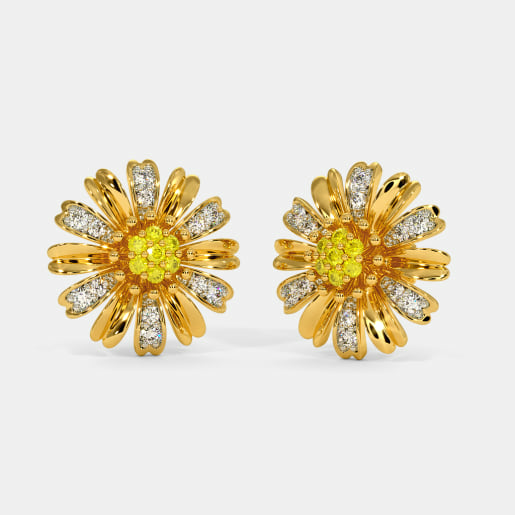 Check out the six petals of yellow sapphire forming a pretty flower in the Moonwalk Earrings. 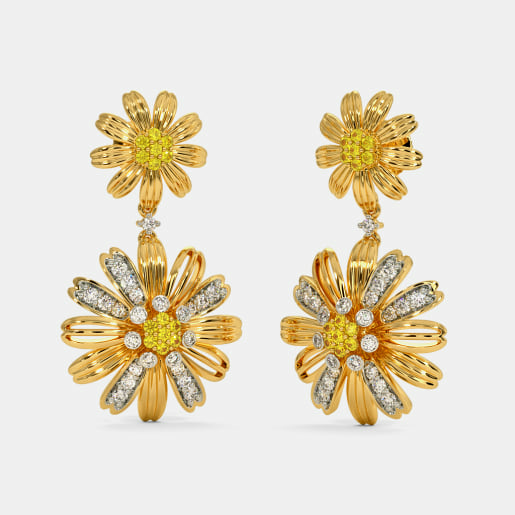 The floral set is surrounded by a hexagonal rim of diamonds. Doesn’t the piece easily make for one that is bound to steal the limelight? 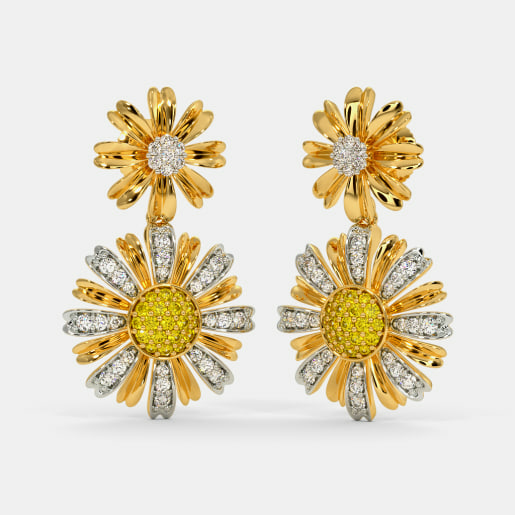 Diamond flowers with alternating yellow sapphire petals are seen in the Licorice Earrings. Giving it a neat and compete finish are studs of diamonds around them in a square fashion. The clash of yellow and yellow sparkle forms the perfect composition of a festive occasion or celebration. Flaunt these to a get-together and watch heads turn. 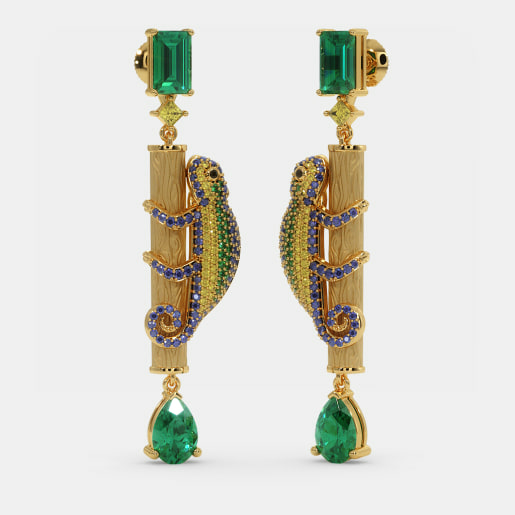 Women who just cannot make do without some bold colours in their ornaments must try their hands on the Caipiroska Earrings. 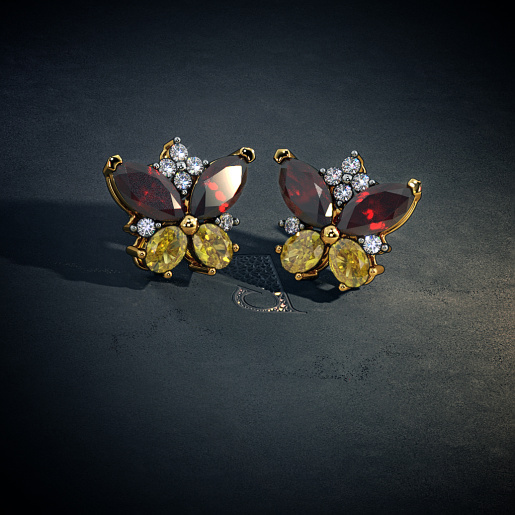 Cute little butterflies fluttering in bold tones of red rubies and yellow sapphire complement just about any function. To add to the dazzle are tiny diamond studs. 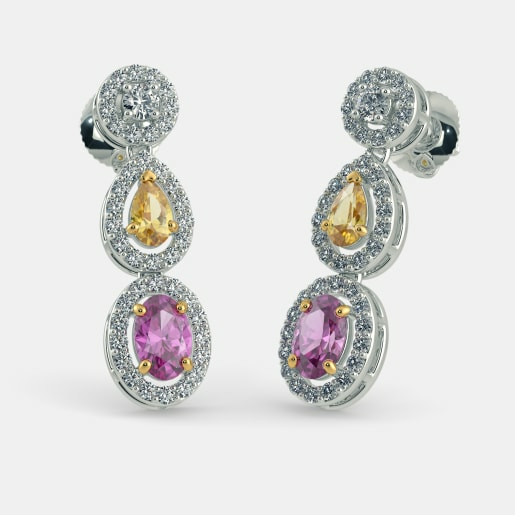 Skim through the yellow sapphire earrings price across categories and take your pick. Clash of hues and glimmering concoctions of multiple gemstones make for the boldest and best of the collections. Drowned in glamour and shining in their definitive hues are some of BlueStone’s most adored designs. If glam and shine are on your mind, look no further. Delve into the collection of hoops and danglers that you would be proud to flaunt at special occasions. Try the likes of the Charmed Brilliance Earrings. 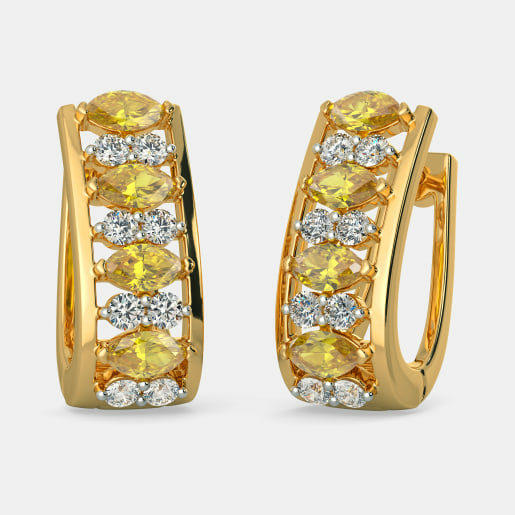 These hoops come with the goodness of yellow sapphires and white diamonds. The perfect combinations account for the entire stretch of the hoops front-end display. 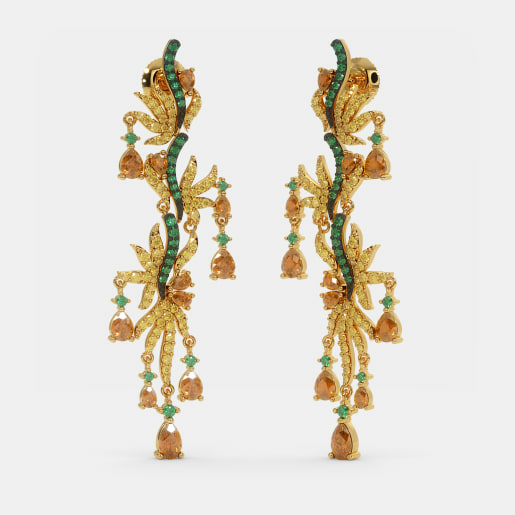 Adding exclusivity to the series is a specific set of earrings that ought to be your most prized possession. Yes, we are talking about the most glamorous, bold and sparkling forms of yellow sapphire earring designs, namely the Modern Gltiz Earrings. The name says it all. Not only are these known for their spells of magic, but they also flaunt more than one layer. A solid chunk of diamond spheres leads to a drop-shaped yellow sapphire that is outlined with diamonds. As if this was not enough, you have a third stone, that is the pink tourmaline in its gorgeous mauve tint shaped in an oval format, once gain surrounded by diamonds. If these earrings sound tempting enough, just tap and place your order right away. We also have exclusive offers running on selected pieces. We indeed let you try on the pieces you like from the comfort of your home with any obligation to purchase. Try on whatever you like and buy only the ones you want to add to your collection.